Digital reading devices exploded on the scene and took down many bookstore chains. Publishing a book became easier than ever and new authors made a substantial amount of money. Simon & Schuster’s digital sales were up about 20% in 2013. In 2012, digital sales rose 36% compared to the prior year. Print sales fell 2.8% last year, compared to a 6.9% decline in 2012. Digital sales, which include both e-books and downloadable audio, accounted for 27% of all revenue in 2013. The ebook dominated the industry from 2012 through 2013 and there were predictions that the printed book would soon go the way of the dinosaurs. However, that prediction was wrong as seen by the decline of digital book sales and the reemergence and popularity of printed books. Authors that solely produced digital books are losing sales. Reports on the Internet are showing that the printed book is fizzling out and that digital book sales are steadily growing, but someone is not producing legitimate facts because statistics show that the printed book is on the rebound. Several studies have shown a strong preference for printed textbooks, notably among those in college who have tried both types. In a HP survey, 57% preferred print; only 21% preferred an ebook. Waterstones, a U.K. book store chain which also sells Amazon’s Kindle, told the Financial Times that demand for the e-reader has all but disappeared. This does not mean that books all around book sales are diminishing. In fact, it’s quite the opposite. Printed book sales have been showing a consistent growth in each quarter over the past few years. Large book retail chains have toppled, but there is a reemergence of the small independent bookstores. The industry itself is flourishing and Waterstones now plans to open a dozen new stores this year. “The rapid growth of ebook sales has quite dramatically slowed and there is some evidence it has gone into reverse,” said Douglas McCabe of Enders Analysis. Sam Husain, the chief executive of Foyles, a London bookstore chain, also told the FT that sales of paper books were up 11 percent this Christmas over last year. A year ago, Empire Publishing’s authors averaged four to one with digital sales leading print. By the end of the third quarter in 2014, digital and print sales were 50/50. Towards the end of the first quarter of 2015, print book sales rose above digital. According to the Nielsen Books & Consumer survey, ebook sales made up 23% of unit sales for the first six months of 2014, while hardcover’s accounted for 25% and paperbacks 42% of sales. So not only did overall print book sales outsell ebooks, both hardcovers and paperbacks outsold e-books as well. What has caused the dramatic decline of ebook sales? There are several reasons for the downward turn, but most notable is the saturation of poorly produced products by authors that solely publish ebooks using automatic conversion tools and cookie cutter cover templates. Authors that solely publish in digital format are limiting themselves in book sales by releasing a sub-standard product, but even more important is the loss of maximum sales potential by not releasing his or her book in print format. Don’t fall behind as the industry rapidly grows and moves forward. Empire Publishing and Literary Service Bureau is here to help authors achieve success. Do you need a publisher to produce a book? There seems to be many bloggers posting articles about not needing a publisher any longer and that a book can easily go into production with the click of a button. This is only true if the author has extensive knowledge in pre-publishing which includes substantial experience in pre-press layout, formatting, editing and graphic design software such as Photoshop and CorelDraw. This must be taken into consideration before distribution and marketing comes into the equation. 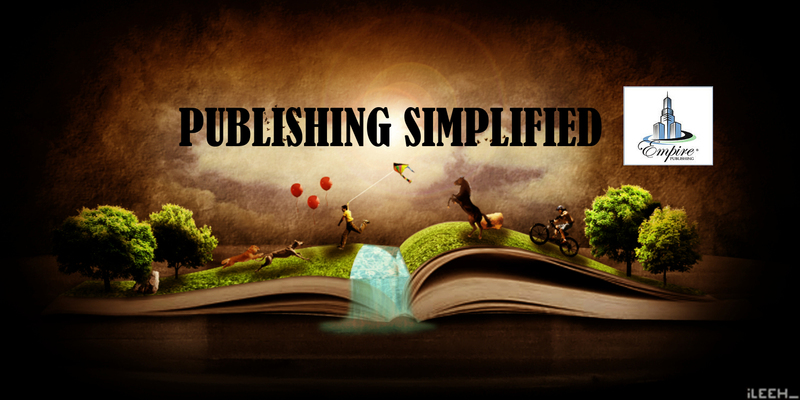 Do you need a publisher? The real question should be, “Do you want to produce a high quality book or a sub-standard product?” By using the template tools such as a cover creator and file conversion upload, what you will get is a poorly produced product, and this is what has given self-publishing such a bad reputation. An inferior product is the kiss of death for any book. Empire Publishing has over 30 years experience in all aspects of publishing and has put in countless hours to build a better publishing company. Publishing packages have been created to meet the needs of any author by combining the old traditional book publishing criterion with modern technology to produce a high quality product that will sell.